Okay, if you’re George R.R. Martin and you’ve just killed off the reader’s new favourite character – again – then you might lose some fans. But most of us are not going to find readers jumping ship as soon as something truly bad happens. Readers enjoy protagonists winning against the odds. They’re satisfied by stories where a happy ending is truly earned. They read fiction because it’s more exciting than real life – and they’ll accept, even expect, a corresponding level of danger and even destruction. I’m not suggesting that you torture your characters for the sake of it (though I’ll admit there’s a certain pleasure in this after a bad day). But if you’re worried about hurting your characters because you think you’ll somehow break them … you’re (a) underestimating them and (b) not giving them a chance to show what they’re made of. They may well need some recovery time – I’ll come onto the logistics of that in a moment. But they’ll pull through. I get it: me neither! I’ve never been able to justify killing off a main character (I can’t even think of an instance when I’ve killed a minor character, except in backstories). Death just seems too final. This is also the one where you might hit a reader backlash, especially if the character was one the reader particularly enjoyed. You might kill off a horrifically evil character and find readers objecting, if that character was a good source of conflict or even entertainment within your novel. Genre may become an issue here, too: there are some genres where readers definitely won’t expect main characters to die. I’m certainly not saying you can’t do it, but obviously you may need to handle things rather differently in, say, a romance compared with a thriller. Without some bad stuff, you wouldn’t have a novel at all: you’d have a boring short story where your protagonist got the promotion they were going for, won the heart of the bloke they loved, and lived happily ever after from page three onwards. I imagine most of us are OK with writing some level of conflict: there’s a rival for the promotion; the lovers argue; that sort of thing. So I’m going to look here at one key area where you might be hitting a sticking point: where some sort of injury or hurt is happening to your character. This starts with bruises and scrapes and goes up to broken bones, internal bleeding, and short-lived illnesses. My main struggle with this type of “bad thing” is when it gets bad enough to warrant a hospital trip or ambulance. I’ll address some of these practicalities in a moment. I’m thinking here of severed limbs, brain tumours, cancer – anything that’s permanent or at least unlikely to be resolved within a single novel. This could need careful handling if introduced part-way through a novel (you might well need some level of foreshadowing). Of course, you could always start off with a protagonist or main character who has an existing serious illness or condition. Some authors find this much easier than physical injury. It could mean anything from a bad day to a broken heart to serious emotional abuse. I find this tricky to write without getting into rather angsty territories. If you want to keep the narrative moving, rather than getting bogged down in the ins and outs of a character’s precise emotional state, you might try focusing on the externals (what do they do that shows how they’re feeling) rather than on their thoughts. If you’re writing fantasy, science fiction, supernatural thrillers, paranormal romance, or anything that goes above and beyond the real world … you may well have elements of this in your novel. Psychic or supernatural pain might be a side effect of using magic (your main character can cast spells but it takes a toll). It could be an attack from a character with psychic powers, or a demon, or an alien – depending on your genre. It’s not necessarily easy to write: sure, readers won’t have any basis for telling you “that’s not what it feels like”, but you still need to make it work. It has to seem real, even though it’s not. For plenty more ideas, plus lots of examples, check out 15 Ways to Make Your Characters Suffer (for the Good of Your Novel). Practical Considerations: How Does Your Character’s Injury Affect the Plot? One of the biggest struggles I have with injuring my characters is that, while it might strengthen a particular scene, it then has an inevitable knock-on effect on the rest of the plot – or at least the next few scenes. At some point, though, a dust-up that results in a few bruises and some easily mopped-up blood just isn’t going to cut it. If your protagonist is, realistically, going to be in hospital for a week – and if nothing relevant is going to happen during that time – then just pick up at the next interesting bit. As with any other boring bits (characters eating dinner, characters having a dull day in the office), you don’t have to describe everything that happens. Sometimes, the demands of your story don’t really lend themselves to having a character whisked off to hospital for a fortnight. Maybe you’ve set the story in a remote village where medical assistance is hours away, or you need to keep a large cast of characters in the same physical location. Something like a migraine (debilitating while it lasts) or broken ribs (very painful but not something that can be splinted like a broken leg / arm) won’t require a trip to A&E, but can be just as effective for your plot as other injuries. This isn’t going to be appropriate for every genre, of course, but sometimes you’ll have the option of a supernatural cure or fix to whatever’s befallen your character (which could be pretty much anything, up to and including death, depending on the parameters of how magic/the supernatural works in your novel). Be careful with this one, though. It could easily end up making the character’s injury pretty pointless, if mishandled. If you’re going down this route, your best bet is probably a partial fix (e.g. magic can speed healing up rather than accomplish it instantly) or a full fix that comes at a price (e.g. your protagonist has to strike a dangerous bargain). It gives you an excuse to involve characters who tend to get sidelined – your protagonist will have a good reason for needing some extra help. Like any physical, external, visible injury, it can be met with concern from other characters. If fights between two of your cast have previously been kept quiet, this might be the first time someone else realises what’s going on. There’s some great discussion of how injuries can help you move your plot along, develop character arcs, and much more in Joanna Penn’s interview with Samantha Keel: How To Write Effective Injuries For Your Characters. One of my favourite reasons to hurt characters is to get them out of the way. If I’m juggling seven or eight characters in a pivotal scene (I find this happens at the end of my novels), then it’s a whole lot easier if some get knocked out of the main action. That might mean literally knocking out a character, or it might mean having them injured in such a way that they can’t participate in the big showdown (depending on how badly they’re hurt, this may also pull other characters out to take care of them or rush them to a hospital). If you’re really struggling to be OK with hurting your characters, use the drafting/redrafting process to help. You can start off with mild peril / injury in Draft One, and work up to increasingly dangerous – and consequential – situations in Draft Four. Alternatively, and probably rather more efficiently, you can start with the worst-case scenario and reassure yourself that you can always just rewrite it if you don’t like it. As a writer, you’re inevitably – and rightly – invested in your story and your characters. You are (I hope!) excited by your writing: you’re drawn into it, just as you hope your reader will be. It can be tough to not only watch good characters suffer, but to make it happen. But just because it feels uncomfortable, or scary, or even leaves you in tears, it doesn’t mean there’s anything wrong with what you’re writing. By all means, ease into it with successive drafts, or plan ahead so you know you won’t be writing yourself into a corner where half your cast are laid up in hospital when you really need them for the final showdown. But don’t hold back too much. Characters who get hurt – and who pick themselves up again, and fight on – will be admired, even loved, by readers. And the stories you tell will be the deeper and richer for it. Want more help writing great characters? 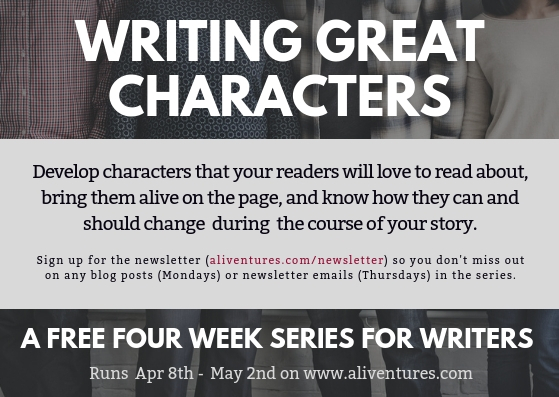 Over the next three weeks, I’ve got more posts (and newsletter pieces) planned about how to bring your characters alive on the page, how to establish sympathy for your not-so-nice characters, which of your characters need a “character arc”, and more. 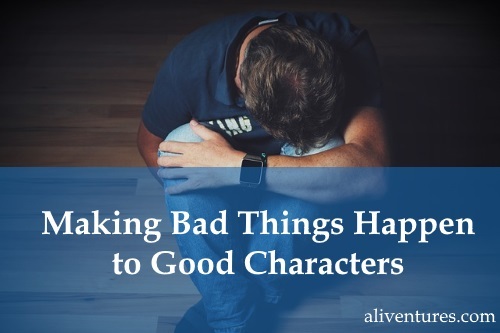 This post is very helpful as I am certainly having a hard time allowing bad things to happen to my good good characters yet I need to so that the story is believable. Thank you for the reminder. Thanks Jenny! Glad this was helpful. It is really tough sometimes to let good people suffer. I don’t typically mind inflicting stuff on my characters; there’s usually one in particular that gets the physical, and everybody gets to wallow through emotional trauma! My big struggle is making it be “their fault”. I’m really having to work at giving them faults, letting them fail, and giving them problems that they caused for them to subsequently fix. I’m so glad I wandered onto this post – haven’t been considering how to realistically have physical damage or how that can re-arrange character dynamics, thanks! Deals that come with a price are a great type of bad thing — sometimes, there’s NO good choice for a character to make, plus you can drive a plot on with the ongoing consequence to a deal (not necessarily a supernatural one, I guess deals with the mafia or something count too). Great tips here, it has sparked a lot of creative ideas for me. Thanks for this. I feel like a power mad ogre when I kill off a character. This restores a proper perspective.